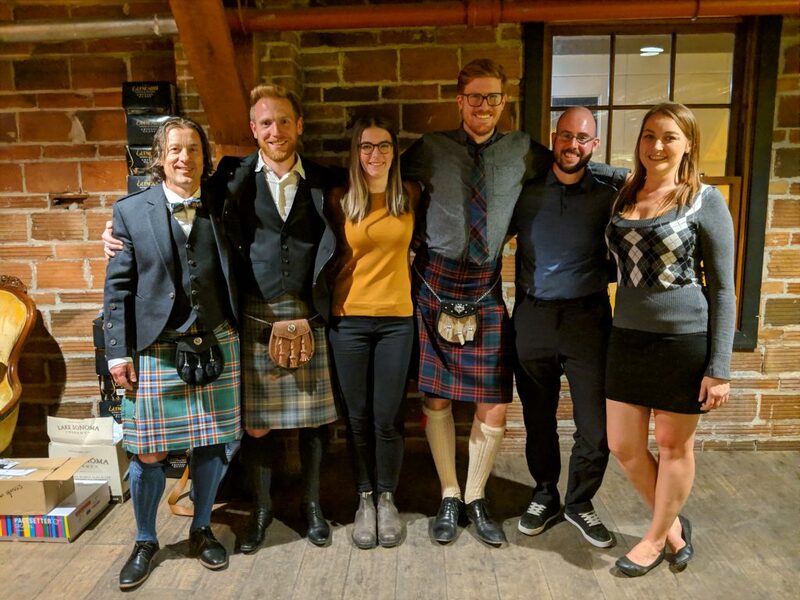 I’m Ben, and some of you might have seen me around here, lurking close to Steve and Claude and Christine, trying to convince you that I’m part of the “Kelowna Scotch and Fine Spirits” Crew, without putting in any of the actual work. But then Steve asked me a few weeks ago if I wanted to give the toast to the lassies tonight, so I guess my freeloading days are over. So when Steve asked me to give the toast I thought to myself “I can do this! I have Scottish parents (this is my Dad’s kilt I stole/inherited), I grew up in a house that hosted Rabbie Burns Suppers, and I have even heard speak of these “fair lassies”. But lo and behold, though, when yesterday arrived, and somehow, even with all of this natural “skill” my toast had not written itself and I had sit down and get to it! So I chatted briefly with my Scottish dad and I asked him “what does it take to give a good ‘toast to the lassies’ at a Burns Supper” and he replied, “well you should give it with a scotch in hand” – check – “and just like any public speaking you should be well prepared. You should get going if it’s happening on Friday” to which I replied “dad, it’s tomorrow”. And after a heavy sigh he replied “well that’s unfortunate for the lassie giving the reply to your toast – I hope it isn’t Ellen!” (my wife, who is, in fact, giving the reply to this gem of a toast). But I guess I should get on to the point of this, which, as far as I can tell (by looking it up on the BBC), is meant to be the “humorous highlight of any Burns Night” and here I’ve inserted a note to myself: if there have been laughs so far, say something clever, like “you’re welcome” and if not, then apologize and say “I’m sorry”. The real point of this toast, though, is to praise the role of women in the world today by using quotes from Burns’ work. Which is somewhat difficult as, if you’re not aware, the role of women in the world today has changed a bit since Burns’ time in the late 1700s, and so has the way one might use prose to convey this. It’s been said that Robert Burns was a great lover of the lassies; he saw lassies as those to be loved, to chase in the pursuit of physical intimacy, and to befriend. Which is exactly the state of women in the world today, right Ellen? Ok, so I pulled up a website of Burns’ poetry which you could search by keyword and entered “woman” – there were just a few hundred poems. No sweat. For fear my jewel tine. And I thought that was nice, but then read the similarly titled “My Wife’s a Wanton Wee Thing” which takes on a very different tone and involves hitting said wife with a claw – not a song to be singing today. So I read on for a while more and found that as Burns aged so did his love and respect of women. I realized this is what happens when a man dies at 37, and a country decides all of his poetry is a national treasure; you end up reading a bunch of poems he wrote in his teens and early 20s. These are love poems written by a teenager – hardly a good place to find poignant and relevant views on women. Ben – It’s been some time since I had the pleasure of giving the toast, but do remember being asked the same question at one of our last Burns Suppers by my friend Paul who was to give it for the first time. I then quickly pointed him in your mum’s direction and said he should talk to her, as she is just more knowledgeable about such matters. Thank you Ben, for those beautiful sentiments, and thank you to Ben’s dad Stewart, for knowing that Ben would need some pretty words to appease his wife. As Ben mentioned, he was asked a few weeks ago to give this toast – which really was very nice and thoughtful of Steve and Claude to give Ben so much time to really ponder and consider what he wanted to say tonight. I was asked to respond to Ben’s toast on behalf of the lassies, and while I won’t rehash his points about preparation I will note that it was with a bit of increasing panic in the last week that I would ask Ben when he was going to write his speech. So I found myself at work this morning, with a freshly written speech in my inbox from Ben, and less than 12 hours to write a response. Now unfortunately I do not have a Scottish father to check-in with about all things Robbie Burns, and I could ask my lovely Scottish mother-in-law about writing the reply to the toast, but, I mean, I have to get this done in less than 12 hours and who would expect someone to help write a speech in that little time! So I turned to Google. Apparently, I am not the only lassie to have this problem. So before I toast the laddies, I wanted to thanks all the lasses who have come before me and from whom I can borrow a few words. Here’s to the laddies – A whole array of them. They’re charming and talented – each one a gem. At eating and drinking and talking so well? What they’re really best at is procrastination. But let us not sell our laddies up short. For they do noble deeds of many a sort. It brings such joy to this section of the pub. And make sure that this time Claude has his microphone off. They’re strong, they’re bold and surprisingly frisky.